The Wavescape Surf and Ocean Festival in Cape Town has added Eric Karangwa (right) and Sue Williamson (below) to the art project, which this year sees 11 surfboards turned into art by South African artists, and one wooden board crafted by youth from the 9 Miles Project, an organisation that uses surfing as a tool to uplift, support and educate. Other notable newcomers are Ruby Swinney, Chris Slabber, Paul Senyol, Kirsten Beets, Swain Hoogervorst, Andrew Sutherland and Chris Soal. 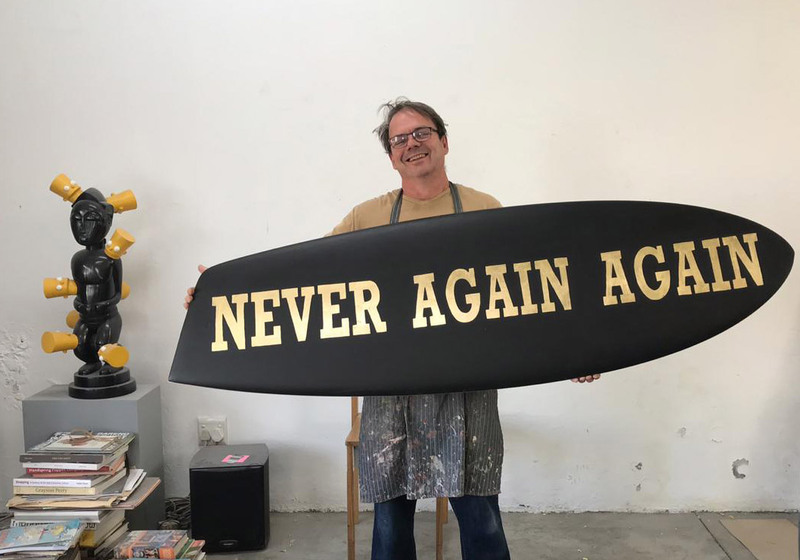 Karangwa and Williamson join famous regulars Lionel Smit and Brett Murray for the exhibition, which is currently on show at Jack Black’s Taproom. The auction, with Nik Rabinowitz, takes place next Wednesday 28 November. Last year it raised R772,000 for ocean-related charities such as the NSRI, Waves For Change and the 9 Miles Project. 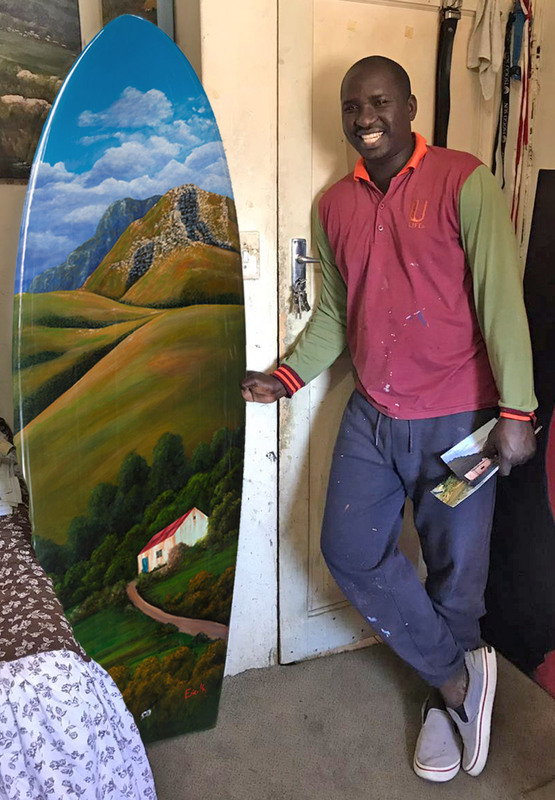 After fleeing genocide in Rwanda and living in refugee camps, Karangwa found his way to Cape Town. 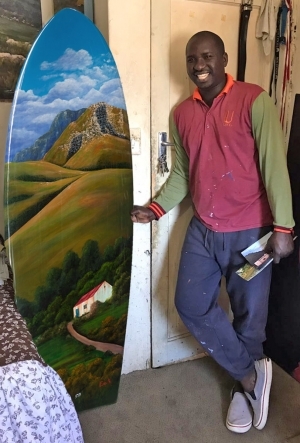 He worked as a car guard at an upmarket shopping mall in Constantia where he taught himself to paint. Now he is sponsored by the Art Society of South Africa and exhibits at Kirstenbosch Gardens with his mentor, Andrew Cooper. FROM LEFT: Brett Murray, Paul Senyol, Chris Soale, Sue Williamson and Swan Hoogervorst. Apart from her work at the Museum of Modern Art in New York, internationally acclaimed Williamson is represented at the Tate Modern and the Victoria and Albert Museum in London. Trained as a printmaker, Williamson also works in photography and video, and is one of South Africa’s biggest success stories. The newcomers to the project bring a unique collection of skills. Chris Soal explores sculpture with pre-existing materials - particularly single use items such as bottle tops and toothpicks. In 2018, he won the PPC Imaginarium prize and is included in local and international collections. Swain Hoogervorst’s first solo exhibition Inside Out took place at the AVA Gallery in Cape Town in 2014 to much acclaim. He has had residencies in The Netherlands (2013) and Finland (2015) and is exhibited nationally and overseas. Paul Senyol has become renowned as a South African abstract painter who reflects the detail of everyday life through an empathy with colour, line and form using acrylics, pastels, ink, pencils and spray paint. The minutely detailed oil paintings of people interacting with nature by Kirsten Beets have graced group shows in South Africa, including Salon91 and Everard Read, and at the Royal Academy of Arts Summer Exhibition 2014 in London. Ruby Swinney (right) works primarily with oil on tracing paper where strange figures that inhabit timeless landscapes. Her work forms part of private and public collections, including Zeitz MOCAA. VETERAN SATIRE: Brett Murray has once again delivered some acerbic iconography. The Platinum award for Photo Manipulation at the A’ Design Awards in Como, Italy (2014) counts as a key accolade for Chris Slabber, who grew up in the Little Karoo. Slabber likes to focus on the subconscious and has received awards for his work in photo manipulation and mixed media. Andrew Sutherland is another inspired by narratives that underpin human encounters with nature. He delights in landscape with painted planes that combine graphic and illustrative elements with traditional technique. 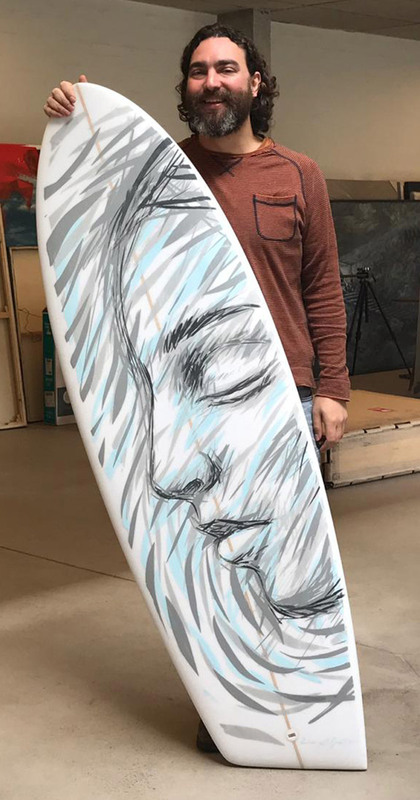 A regular at the Wavescape Artboard Project is Lionel Smit (right), best known for his contemporary portraiture through monumental canvases and sculptures. He has exhibited at the National Portrait Gallery in London. In 2017, his artboard was auctioned for R120,000. The enigmatic “dark prince of South African pop (art)” Brett Murray works with steel, bronze and assorted media to critically entertain via skillful manipulation through satire and subversion. 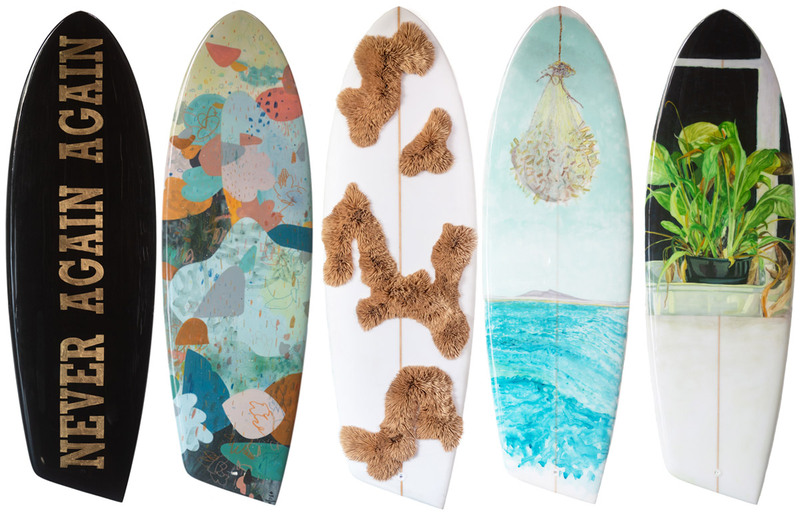 The Wavescape Artboard Exhibition went live from yesterday 19 November at Jack Black’s Taproom (10 Brigid Road, Diep River) and runs until the auction from 6.30pm tomorrow Wednesday 28 November. 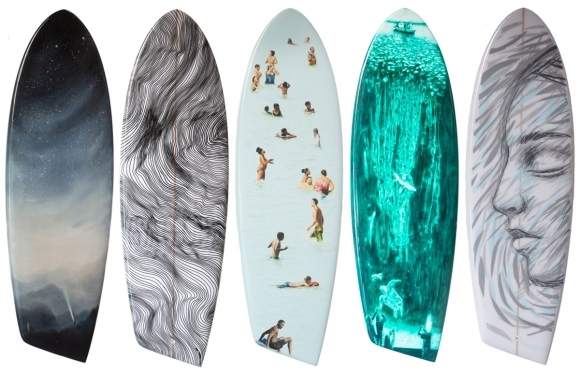 The boards are asymmetrical shortboards.